Fit Foodie Megha: Vaya Tyffyn Box – Stylish and advanced Tiffin box — Reviewed! Vaya Tyffyn Box – Stylish and advanced Tiffin box — Reviewed! How many of us remember carrying tiffins to school and offices? We usually avoid to carry homemade food or tiffins because it gets cold. 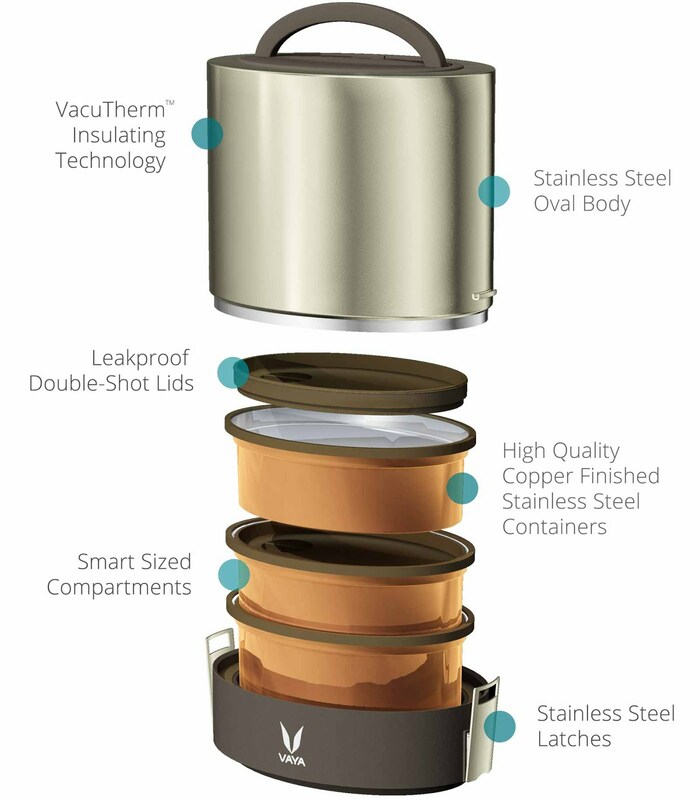 Just when I was searching for some newly innovated technology to keep food warm and fresh, I was approached by Vaya Tyffyn to review their product. Vaya Tyffyn comes into two sizes..1000 ml and 600 ml. 1000 ml is a 3 container lunch box while 600 ml is a two container, vaccum-insulated lunch gear that is good for small snacks or quick office grabs. In the first look, it is quite impressive, elegant and stylish. Small 3 compartments in a 1000 ml are enough to carry variety of foods. I am glad now, I don't need to be worried about the temperature of the food. Frankly, I am yet to try for a longer time but I am sure Vaya Tyffyn box will exceed my expectations. One more interesting part is it is compact in a way, that the bagmat converts into the tablemat with a cutlery pouch. The tablemat is easy to wash too. So, you just have to pack, carry and enjoy. Fold it again and you are ready to go! So easy. Even kids can carry and pack it easily. For them its the fun part. My small concern is it is bit heavy. I am sure 600 ml is easy for kids to carry. People can choose from the variety of finish. I loved the maple one, but they have Graphite and Wool. Graphite is simple, basic, classic grey finish while the Wool is beautiful purple color. 1000 ml and 600 ml Vaya Tyffyn box is priced at Rs.2990 and Rs.1990 respectively which is a bit steep but totally worth of that style, hot food and technological innovation. I am glad because now no more plastic tiffins, no more cold food. Vaya Tyffyn is a part of my daily routine. No more wastage of time to stand in queue to heat food in the office pantry. Also the spill-free option along with the mat gives me the freedom to eat at any comfortable place. Vaya Tyffyn boxes are strategically designed and caters everyone's need. This is an eye-candy and whenever and wherever you'll carry it, I am sure people will envy you. Look no further, you can purchase this wonderful product from Vaya site.